It’s the year 4847, over a thousand years since the end of a mass extinction event, caused by human activity, that resulted in the demise of eighty percent of the Earth’s animal species. The Cagoan District, in the area southwest of Lake Mishkin, was long thought to be lifeless, marked only by large ruins of an ancient urban city that flourished from 1837 to 2620. But a landmark survey in the year 4797 revealed that several new, highly adaptable species had developed in the Cago area. Chief Scientist Willek Muriday has now issued this Field Guide to Creatures of the Cagoan District for the benefit of biologists living in this future world. This guide features eight of the strange creatures that now thrive in the Cagoan District, with three-dimensional pop-up models of the creatures, explanations of the unique characteristics they have evolved, and related illustrations and diagrams. 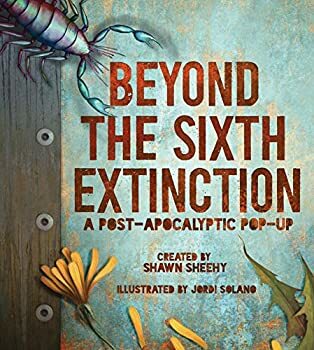 The premise of Beyond the Sixth Extinction: A Post-Apocalyptic Pop-Up (2018) is based on The Sixth Extinction: An Unnatural History, a 2014 non-fiction book by Elizabeth Kolbert. This winner of the 2015 Pulitzer Prize in General Nonfiction argues that humanity is in the process of causing the sixth worldwide extinction event in the history of our earth, and that disastrous changes to Earth are occurring because of global warming, pollution, widespread travel and trade (leading to introduction of invasive species), and other human activities. 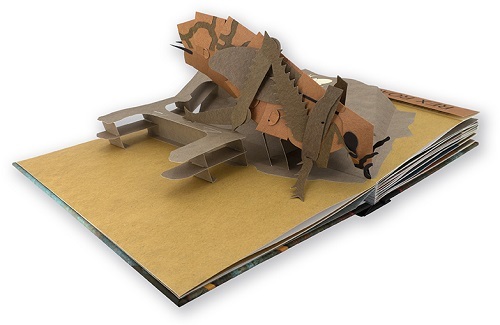 Sheehy, an accomplished paper engineer, has created large, multi-layered pop-up sculptures for each of the eight species featured in this book. The pop-ups are made of cardstock-weight paper and are reasonably sturdy, though I doubt they’d survive an attack by a determined toddler. Each entry also includes a fold-out section that summarizes the key characteristics of the animal or plant, and a two-page section follows each pop-up that describes the creature in more detail, with excellent full-color illustrations by Spanish illustrator Jordi Solano. Beyond the Sixth Extinction also includes a chart outlining all six historic extinction events, a diagram of the Cagoan ecosystem showing how all of these species interact with each other, and a map of the District of Cago. 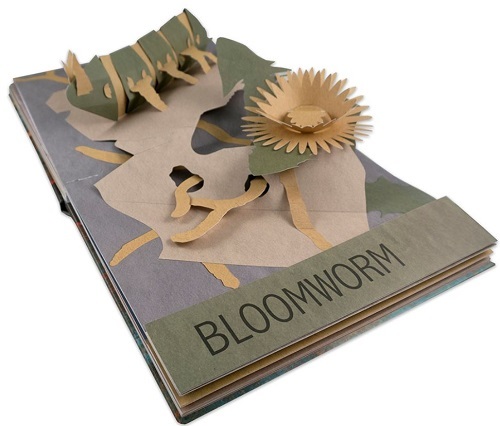 Beyond the Sixth Extinction is a gorgeous and creative book with unusual pop-ups. Its list price is $65 (though Amazon currently has a much lower price listed) so it’s somewhat of an investment, but it would make an entertaining coffee table book or gift for an older, scientifically-minded child or teen, as well as interested adults. I could see this book prompting some fascinating discussions about our world and our relationship to it. Published October 8, 2018. Elaborate pop-ups feature some wonderfully creepy creatures that just might dominate the ecosystem and be essential to our planet’s survival in an eerily realistic future world. Whether or not we know it, the sixth global extinction is already under way, propelled not by a meteor but by human activity on Earth. Take a long step forward into the year 4847 with the help of stunning pop-ups portraying eight fantastical creatures, along with spreads and flaps presenting details about each one. Paper engineer Shawn Sheehy envisions the aftermath of extinction as a flourishing ecosystem centered around fictional creatures that could evolve from existing organisms. Promising high appeal for science-fiction fans of all ages — and plenty of food for discussion — this evolutionary extravaganza offers a time line of the six extinction events in Earth’s history, a “field guide” to each creature, a diagram of species relationships, a habitat map of the (imagined) ruins of Chicago, and an illuminating author’s note. I’m a sucker for pop-up books, and this looks strange and beautiful. I guess I could save my change and consider it a Christmas gift to myself.